ST. JOHN'S, Antigua, Dec 5 2015 (IPS) - Antiguan Veronica Yearwood no longer panics when she hears that the rainfall forecast for the tiny Caribbean island is again lower than average rainfall. Not because she is a hydrologist in the water department of the Antigua Public Utilities Authority. “We went passed that stage. We did panic, but we have now settled down to the reality that the drought is really going to be a very bad one; it’s not going to end tomorrow,” she told IPS. “So we’ve decided to look at ways to mitigate, use what we have sufficiently,” Yearwood said. Antigua, a 108.5-square mile island of 80,000 people in the northern Caribbean, has been experiencing severe drought conditions for the past two years. “We have rationing schedules,” she said, adding that some residents of the island harvest and store rainwater. “And in some cases, whenever the water is on, I need to top it up, so I top up my storage. That’s basically how we survive. I tell my household we are in a severe drought so we have to ration and we have to conserve,” she said. “Two years we have been in a drought in Antigua. Most persons did not believe it, until now we are seeing the physical evidence of it. “There is absolutely no water in the catchment. The farmers are crying. Some farmers who have never ever had the municipal water have been applying for the service. They have never seen it so bad before and this is the worst in my tenure that I have seen,” said Yearwood, who has been a hydrologist for more than 30 years. But the climate outlook for the Caribbean region for the six months ending May 2016 will bring no comfort to Antiguans and other Caribbean nationals who have also been battling drought conditions. At the biannual Caribbean Climate Outlook Forum (CariCOF) held here November 26-27, ahead of the dry season, which traditionally runs from December to May, forecasters said that most of the Caribbean is expected to have lower than average rainfall. “For the upcoming dry season, we are expecting above normal temperatures for the entire region,” Elmo Burke, senior meteorological officer at the St. Kitts Air and Seaports Authority told IPS on the sidelines of the CariCOF. He says the northern islands of the Lesser Antilles chain all the way down to Trinidad, just off the South American mainland, are expected to have below normal rainfall. Caribbean nations west of Puerto Rico, however, can expect above normal precipitation for the next three months. “As it relates to the drought conditions, the majority of the island chain is expected to be under a drought warning,” Burke said. Certain parts of Puerto Rico will be under a drought emergency. CariCOF brings together weather forecasters, water resource managers, and agriculture stakeholders among other professionals. The nation in 2015 received just about 55 per cent of its average rainfall. “At a time when we, here in the Federation of St. Kitts and Nevis, anticipated significant rainfall, we were instead faced with a water crisis, due to below average rainfall,” Brenda Boncamper, permanent secretary in the Ministry of Public Infrastructure told IPS. “Our water services department has been experiencing a very difficult 2015, a reality we have not experienced in the Federation in over 30 years,” she added. Burke says the effect of the less than average rainfall on St. Kitts is going to be pronounced in the dry season. 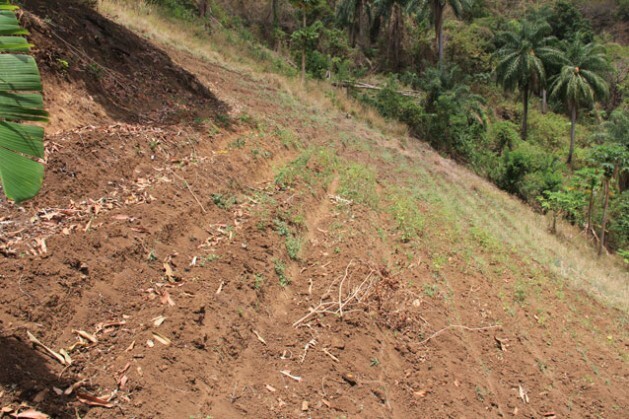 Experts say that the entire region is experiencing a drought, including Dominica, where Tropical Storm Erika in August left damage and loss amounting to 95 per cent of GDP, according to government estimates. The erratic weather, experts say, is directly linked to human induced climate change. Boncamper agrees. “Clearly, we can see climate change at play here with its extreme weather and climate events. From all accounts, we can only expect more of this type of weather in 2016,” she told IPS. Lester Arnold is coordinator of the Reducing Risks to Human and Natural Assets Resulting from Climate Change (RRACC) Project at the Organisation of Eastern Caribbean States (OECS) Commission. “Climate change is real. It is here to stay and it is not going away,” he told IPS at the CariCOF. “Climate variability also is creating a bit of a havoc on some of the island states, as we have seen for this year with regards to the drought. This is the second time in the history of Potworks Dam in Antigua (the island’s largest) that it has gone dry. We have also seen the highest temperature on record for the last 50 years or so. “So I definitely can say that climate variability is causing some trouble,” Arnold says. Caribbean leaders and negotiators will use real life experiences like those in Antigua, St. Kitts and Dominica to make to the international community at the world climate change talks in Paris next month, a case for a legally-binding agreement that will cap global temperature rise. Experts say that human-induced global warming must be kept lower than 2 degrees Celsius above pre-industrialisation levels. This, they say, is necessary to avert catastrophic climate events such as those being experienced by Small Island Developing States (SIDS), such as those in the Caribbean, and other countries across the world. “So targets which are set, which are legally-binding and we have a mechanism to monitor them,” he told IPS. Gonsalves will face the electorate in general elections on December 9, but says that the talks are so important to his country and the region, that he would be on a flight to Paris on Dec. 10, one day before the talks are scheduled to end, if re-elected. But whatever the outcome of the Paris talks, which Caribbean leaders say are too important to fail, forecasters say they are very confident that dry days are ahead for Caribbean nationals. “We’ve always had droughts and the research has shown that the droughts have always occurred at a given period of time. But they’re severe and they come at a quicker interval than the used to, say from the 1950s to now,” Yearwood told IPS.